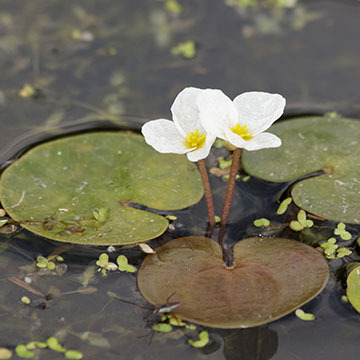 Frogs Bit is a free-floating aquatic plant with heart-shaped leaves and white flowers. Frogs Bit is a free-floating aquatic plant native to Europe and Asia. It has heart-shaped leaves that are about 1.5-6.5 cm long. Attached to its leaves, Frogs Bit has 4-6 cm long stalks. Because Frogs Bit is free-floating it is not connected to the sediment at the bottom of the water. It does have unbranched, root-like tendrils that dangle underneath the water's surface. Frogs Bit produces yellow-petaled flowers during the summer months. Frogs Bit can be found in Washington, Michigan, New York, and Vermont. Once already established in the wild, Frogs Bit is normally spread by humans through boats, trailers, and other aquatic equipment. Water currents can also spread Frogs Bit. Dibrox® herbicide is effective in treating Frogs Bit. Alternative Products in treating Frogs Bit include: Diquat. You can order these products on this website.